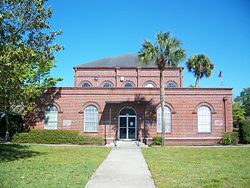 Trenton is the County Seat of Gilchrist County, the smallest and newest county in Florida, lying at the intersection of highways 26 and 129. In fact this intersection is the ONLY stoplight in this entire agriculture oriented county. Trenton was once a thriving railroad community on the Florida West Coast Line and was well known for its Coca Cola Bottling plant, which still stands as a large and well known quilt shop. Trenton is a small, quaint, peaceful community with the convenience of the city life only a short distance away. The rapidly growing town of Newberry is 15 minutes to the east and Chiefland, the commerce center of three counties is 15 minutes to the southwest. Gainesville, home of the University of Florida Gators, where you will find a wide array of shopping, dinning, clubs, hospitals and activities, is only a 30 minute drive to the east. Trenton is in close proximity to Cedar Key and the Gulf of Mexico, while still being a safe distance inland away from hurricanes. There’s a good selection of restaurants ranging from good ol’ down home southern cooking to Mexican and Classy Italian. The Rails to Trails program has taken over the old railroad line and the old depot is now the trailhead of over 30 miles of a paved biking and walking trail which even crosses the Suwannee River on the old railroad bridge and goes right by Fanning Springs State Park.